Although originally intended for use by Catholics, Preaching the Lectionary has become truly ecumenical in intention and tone. 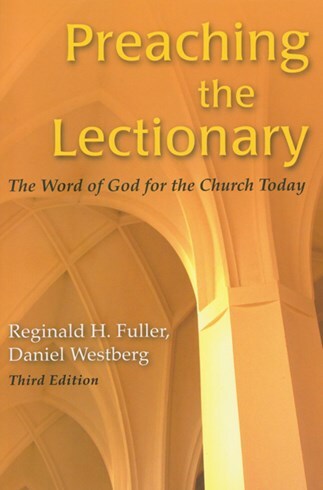 It is based on the New Revised Standard Version and integrates the Revised Common Lectionary to enhance the versatility of the preacher’s task of proclaiming the Word of God as effectively and as broadly as possible. This third edition of Preaching the Lectionary will appeal to homilists and others who have a ministerial or preparatory role in the Sunday liturgy. Written with the needs of the active pastor, homilist, and liturgist in mind, it offers brief, technical discussions balanced with practical insights and reflections. This new edition of a classic approach to the Lectionary has been updated to reflect the thinking of a wide range of biblical scholars and theologians. Reginald H. Fuller, STD, DD, a former parish priest and seminary professor with a specialty in New Testament literature, has written numerous books. He lives in Richmond, Virginia. Daniel Westberg, D Phil, is a former parish priest who teaches moral theology and Christian ethics at Nashotah House Episcopal Seminary in Wisconsin. He is the author of Right Practical Reason, a book on the ethics of Thomas Aquinas. Fuller and Westberg provide a valuable resource for preachers: easy to access and understand, providing basic and valuable information about the texts, and providing hints for homological development. Each section will make for valuable reading for preachers early in the week so their reflections might result in preaching which is both consistent with the texts and stimulating for contemporary Christian application. The Right Reverend Robert W. Ihloff, D.Min., D.D.
. . . will appeal to homilists and others who have ministerial or preparatory roles in the Sunday Liturgy. The excellent notes on Preparing the Homily originally written for the Second Edition are retained in their entirety. Comments on each Sunday's Scripture readings are concise, insightful and scholarly while the homily hints give preachers several options from which to approach the homily, depending always on the relevant events or situations facing the congregation. . . . a complete homiletical guide for preachers of all mainline Christian Churches.